We’d love your help. Let us know what’s wrong with this preview of Myths of Light by Joseph Campbell. To ask other readers questions about Myths of Light, please sign up. I am eternally grateful for the existence of Joseph Cambpell. His way of offering of this knowledge of mythology is excellent. Not only he knows SO much, his books are easy to read and quite funny. I have a soft spot for India, and Vedanta so this book is one of my favourates. Jospeh Campell knows- or knew - how to find the red threads, make meaningful comparisons, and bring the meaningfulness of our lives before our eyes. Myths of Light is a compilation of articles and lectures given over the years by Joseph Campbell. The topics explored in these pieces are quite varied. However, the main theme that ties these works together is that they all explore aspects of Eastern belief, mythology, iconography, and symbolism. 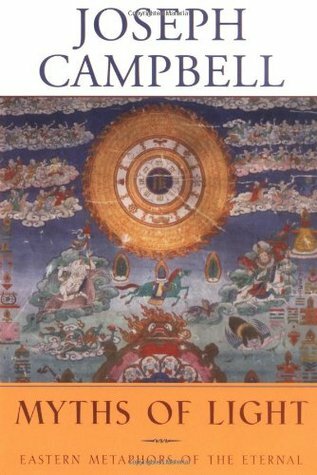 Written from the perspective of the outsider taking a look into the beliefs and mythology of the East, Campbell provides an insightful overview. Campbell takes the stance that whether our stories are ba Myths of Light is a compilation of articles and lectures given over the years by Joseph Campbell. The topics explored in these pieces are quite varied. However, the main theme that ties these works together is that they all explore aspects of Eastern belief, mythology, iconography, and symbolism. Written from the perspective of the outsider taking a look into the beliefs and mythology of the East, Campbell provides an insightful overview. Campbell takes the stance that whether our stories are based upon fact or are merely fiction meant to illustrate proper behavior really isn’t the issue. The truly important thing is that within mythology, dogma, and ritual we see the remnants of belief. Myths of Light is an absolutely wonderful book -- genuinely full of light. Campbell explores some well known imagery and some not well known imagery -- all with the aim to illuminate the reader and the world. If you're looking to better understand the imagery and myths of the "East," then this is your book. Joseph Campbell writes, “That’s the whole sense of mythology, to help you to harmonize your individual life with the general life, the life of the society and of the universe.” Which is why I read Joseph Campbell. This is an excellent overview of many aspects of Eastern philosophy and religion, contrasted with Western. Like most of Campbell's works, this was a delight to read. Campbell breaks down the philosophy & psychology behind eastern religions, comparing and contrasting them to traditional western thought in a way that relates them to our forms of thought. He focuses on the fact that Hinduism & Buddhism have at their center a pursuit of non-being, of extinguishing the “I” or ego. This goes beyond what we think of as the “I” or ego; this doesn’t mean “don’t be a selfish jerk,” it means “go beyond the person who is you until there is no one there, until yo Campbell breaks down the philosophy & psychology behind eastern religions, comparing and contrasting them to traditional western thought in a way that relates them to our forms of thought. There are great sections that breakdown spiritual practices from Hinduism to Zen, and many stories from sacred texts or just fables which illustrate ideas central to those religions. Campbell brings his pals Freud & Jung along, as he usually does, and there are several points where the psychological effect of these world views are examined, too. Really wonderful stuff. One thing is for sure, you can never go wrong in choosing a book written by Joseph Campbell. Myths of Light is no exception to this rule. This is a thorough and enlightening exploration into Eastern philosophy, especially the Vedic philosophy of Hinduism. After reading this book you will want more from one of the greatest minds of the 20th century. Recommended to David by: I'm a big fan. A very good book. I love reading his lectures, which this book is a collection of, because Joseph was a very engaging and entertaining lecturer. Listening to or reading his lectures has helped me greatly in my life and this little book has done the same for me this week. --From A Reader's Journal, by d r melbie. Written well, in Joseph Campbell voice. Just like listening to him speak. I thought it did a nice job of illuminating easter thought and contrasting and comparing it to western thought and religions. One can never have to much understanding. I have never been let down by anything that Campbell has written. This one and pathways to bliss are as of now my two favorites. For the Campbell fans i would highly recommend the lecture series "Mythos" with Susan Sarandon. I love Joseph Campbell and I learned more about Eastern religion and philosophy by reading this book. We all should know where our belief systems come from. One of the best books I've ever read. This book is Indispensable as a reference on eastern cultural religion/mythology (especially India) for westerners. Another great read by Campbell. This is the book that got me into anthropology. This is yet another great work from the mind of someone who gave the world so much. It is one of those books you could happily suggest to friends because you know that they too, will discover gems of wisdom on its many paths. My favourite book by Joseph Campbell thus far. Provides a succinct survey of Eastern mythology and highlights the major points of distinction when compared with Western mythological traditions. Enlightening and deep, just as most of Campbell is. Go steady with it, do not let the small size make you think you will get through quickly. It is very well done and digestible, with time. The perfect companion to 'Thou Art That.' I recommend reading them both. Joseph Campbell was an American author and teacher best known for his work in the field of comparative mythology. He was born in New York City in 1904, and from early childhood he became interested in mythology. He loved to read books about American Indian cultures, and frequently visited the American Museum of Natural History in New York, where he was fascinated by the museum's collection of tote Joseph Campbell was an American author and teacher best known for his work in the field of comparative mythology. He was born in New York City in 1904, and from early childhood he became interested in mythology. He loved to read books about American Indian cultures, and frequently visited the American Museum of Natural History in New York, where he was fascinated by the museum's collection of totem poles.